One of the things that a lot of people need in their game room is controlled lighting. It can come in very handy whether you’re watching TV, playing pinball, etc. 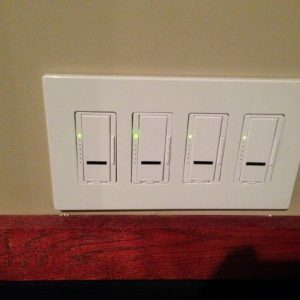 There are a variety of different dimmers on the market, but in general the most popular ones are made by Lutron. In my home theater, I installed 4 of the infrared controlled dimmers to control my different lighting sections. The only downside is that you basically need some sort of smart remote if you have more than one of the dimmers, as the remote that comes with it will control all of the switches at once (instead of independently). I bought a Harmony 650 remote to control the switches. I have a picture from my home theater at the right. The presets are what you use in order to come up with the lighting sets you want. I have mine set to turn off the main lights and just have the side lights on, works great when trying to watch the screen and you need a little light.